to the side of the hole. Aiming Method Y is different to the other methods of aiming. It is a popular for short breaking putts. This method works best on putts under 10 feet. The idea is to imagine a line of golf balls even with the hole, and then aim for one of them. It is highlighted by Yvon Legault (using coloured balls) in his book Become a Putting Machine. The analogy he uses is from baseball. The hole is the plate and each coloured ball is the position of the catcher's mitt. For most pitches (putts) the aimpoint won't be the plate (hole), but the catcher's mitt (coloured ball). Bernhard Langer in his book Langer on Putting writes that he usually imagines a number of golf balls beside the hole and then aims for one of them. He sees his putt as a straight line to the chosen aimpoint. He goes on to say that he does not think in inches, always in terms of ball width. If you use this technique then you should understand that your brain functions best when you give it specific information. It is better to choose an exact aimpoint (target), say the centre of an imaginary ball to the right of the hole, rather than aiming about an inch or so outside the hole. The more you can narrow your focus to a precise target, the more your brain will lock on to it. In putting, near enough is never good enough. By way of an example take a plastic bucket and place it at a distance of five paces. Using half a dozen balls toss each in turn into the bucket. 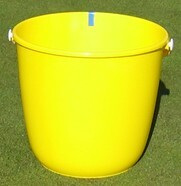 Now place a distinctive mark on the rim of the bucket and repeat the exercise. This time focus on the mark rather than on the bucket. The premise for this exercise is that you should score better when you shoot at a specific target rather than just aiming in the general direction. One advantage of aiming at a target at the same height as the hole is that of improved distance control. When you aim at an intermediate target between your ball and the hole, the distance to this target is shorter than the distance to the hole. This can result in you concentrating only on your foreshortened target and neglecting the strength of stroke to get your ball to the hole. Aiming Method Y is a made-up name like Aiming Method X. You won't find it in any putting instruction manual. However, the technique of selecting an aimpoint to the side of the hole on a breaking putt is an established practice. This said, it is not a technique that everyone uses. Some golfers visualise in straight lines, and for them every putt is a straight putt irrespective of the break. Other prefer picking an entry point at the hole and work backwards visualising the path the ball will take. It largely depends on whether you like a definite structure, or putt more by feel seeing a curved path in preference to a specific spot. There is no right answer. It is up to you to discover your preference on how you aim best.